SoftPlanet makes it possible for everyone to get free Ghostscript Portable download directly from our servers. There is no registration needed for downloading. Ghostscript Portable 9.10 is a high quality, high performance Postscript and PDF interpreter and rendering engine. It can be used with other apps like Scribus Portable. It is absolutely free of charge, which means you don't need to pay anything in order to have it installed on your PC. This software utility works as an interpreter for the PostScript language and Adobe Portable Document Format (PDF). It can work as a set of C procedures, which implements the graphics and filtering capabilities that appear as primitive operations in the PostScript language and in PDF as well. 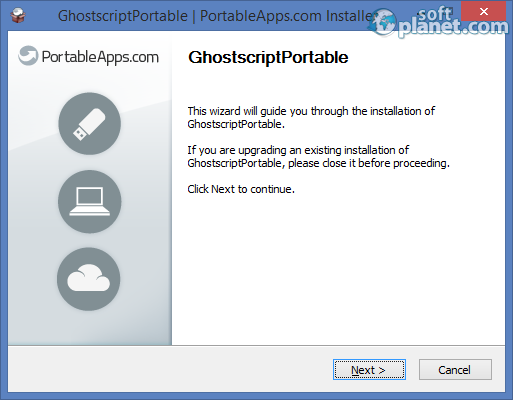 Ghostscript Portable 9.10 is a software utility, developed by developers for developers. As you probably have noticed it is not aimed at regular users. However it really does a great job as a Postscript and PDF interpreter and rendering engine. Our security scan shows that Ghostscript Portable is clean from viruses. The current version of Ghostscript Portable has been scanned by our system, which contains 46 different anti-virus algorithms. That ensures that Ghostscript Portable 9.10 is 100% safe for your computer.